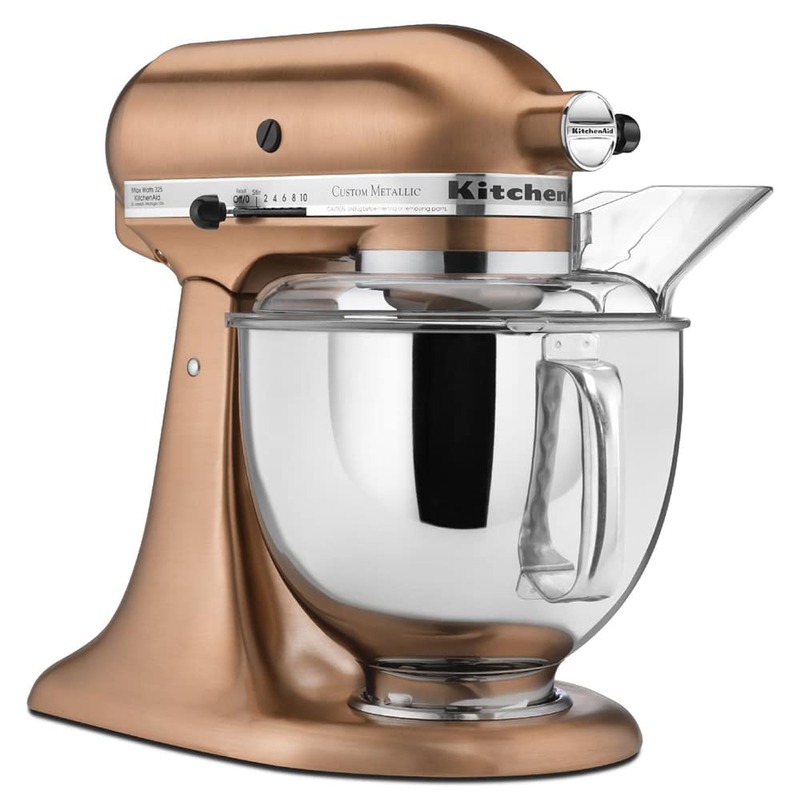 This KitchenAid Metallic® Series stand mixer has 10 speeds that can be easily adjusted by the operator with a side knob and can whip, beat, mix and stir up to nine cups of flour in each batch. The head tilts back to allow access to the mixing bowl and beater, and a screw located underneath the tilting hinge can be turned to adjust the height of the beater. This stand mixer has a planetary mixing action with 67 touch-points around the bowl for complete and thorough mixing. 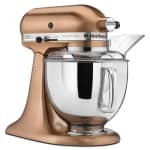 The stand mixer has a metallic satin copper body color and a five quart stainless steel work bowl. 5 quart Custom Metallic® Series stand mixer, polished stainless steel bowl with comfortable handle, coated flat beater, coated dough hook and wire whip, 2-piece pouring shield, custom 5-step plating process, 325 watts, 120v/60/1ph, Satin Copper. Warranty not valid when used in commercial environment such as a bar or restaurant. "I have made two loaves of banana bread with it so far, which was the day I got it. I am new to this mixer. Having had one before, in the 70's, I..."
"I have made two loaves of banana bread with it so far, which was the day I got it. I am new to this mixer. Having had one before, in the 70's, I didn't believe it would scrape down the sides as it mixed. But it did. I am a bread maker. Can't believe it will knead but that is my next project. And, it's so pretty on my kitchen counter."